QuickLogic Corporation (NASDAQ: QUIK), the innovator of ultra-low power programmable Customer Specific Standard Products (CSSPs), today announced the introduction of the ArcticLink® 3 S1, an Ultra-Low Power Sensor Hub Solution Platform for mobile devices. The S1 platform integrates sensor management and fusion, optimizes application processor communication, and enables always-on context awareness by reducing power consumption to approximately 1% of system power. The current generation of smartphones typically implements sensor fusion with software running on a microcontroller/microprocessor or with fixed-function application specific standard products (ASSPs). These microcontroller or microprocessor-based solutions do not operate at a low enough power to keep the impact on battery life at less than 1% without increasing the battery capacity, which is costly in terms of cost, size and weight. Additionally, the ASSP solutions do not currently have the flexibility required to utilize the new algorithms that are being developed for context awareness. QuickLogic re-invented the sensor hub architecture by coupling a micro-coded state machine for front-end sensor management with an ultra-low power Complex Instruction Set Computer (CISC-based) arithmetic logic unit (ALU) for real-time sensor data processing, and an embedded array of reprogrammable logic. The new platform enables the offloading of real-time management and computing of sensor data from the smartphone application processor to achieve power levels that enable the next set of sensor use cases in mobile devices, or always-on context awareness. OEMs and third-party software developers can now realize the myriad of applications requiring always-on context awareness such as step counting and other health and fitness monitoring, pedestrian dead reckoning/indoor navigation, consumer behavior analysis, targeted advertising, real-time sports data collection, augmented reality, and more. The ArcticLink 3 S1 platform integrates a unique set of QuickLogic technologies. 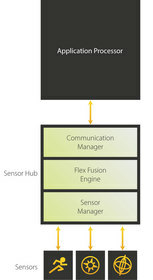 The Sensor Manager implements a very low power I2C master interface that communicates with multi-axis sensors such as accelerometers, magnetometers, gyroscopes, ambient light sensors, and pressure sensors, sampling and buffering multiple seconds of the sensor data at extremely low power levels while allowing the system's application processor to remain asleep. The integrated Flexible Fusion Engine (FFE) is specifically designed to process, filter and interpret sensor data prior to sending to the host application processor. The micro-code running on the FFE can be programmed to implement a host of complex arithmetic functions associated with sensor fusion, background sensor calibration and context change algorithms. The ArcticLink 3 S1 platform is capable of fast response motion sensing for high speed gaming and image stabilization applications and has a programmable communications manager that optimizes data transfers to the host application processor. Lastly, since the S1 platform is based on QuickLogic's latest ultra-low power real-time reprogrammable logic, the platform can be customized for different OEM requirements. In addition to the platform, QuickLogic has developed a software tool, called Flexible Fusion Engine Algorithm Tool (FFEAT), for developers to define, simulate and map their algorithms to the FFE. The patent-pending system solution of the AL3S1 platform and the FFEAT tool represents a paradigm shift in how OEMs deploy sensor algorithms in a very energy-efficient implementation. "Smartphones continue to represent a large, high-growth market for the MEMS market," said Jérémie Bouchaud, director and senior principal analyst for MEMS and Sensors at IHS. "By 2016, nearly all smartphones and tablets will include inertial MEMS sensors such as accelerometers, magnetometers and gyroscopes. These sensors, combined with sensor hub technology that provides always-on contextual awareness at minimum battery drain can enable a host of new 3rd party applications." "Designers of smartphones, tablets and other mobile devices have been asking for a sensor hub solution that can provide the computing power necessary at 1% of system power, and with our new ArcticLink 3 S1 Sensor Hub solution platform we have answered their requests," said Brian Faith, QuickLogic's vice president of worldwide sales and marketing. "With this solution, OEMs can implement always-on context awareness, enabling a whole new generation of capabilities and applications that were previously impractical."